This post is the first in a series about the Clinicaltrials.gov website. 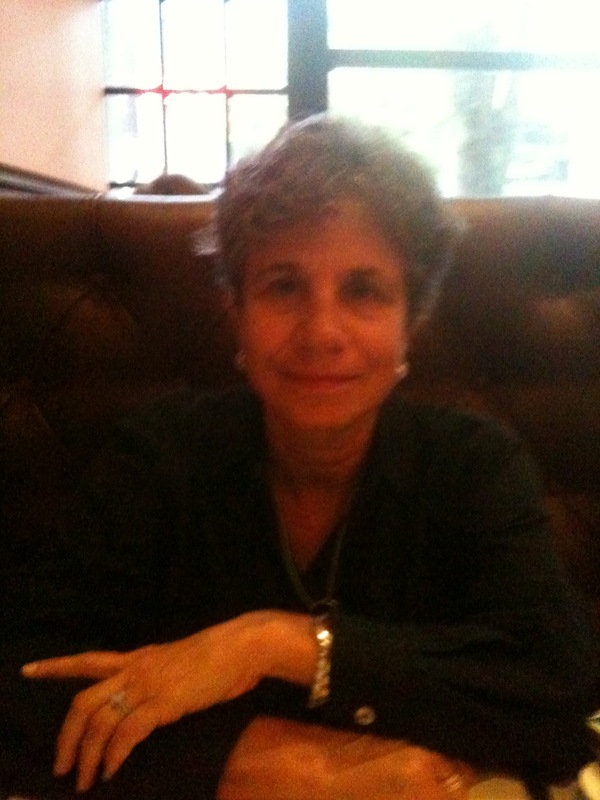 This piece is an interview the Director, Dr. Deborah Zarin. I want to thank her for taking the time to answer my questions. Later, I will post Part 2 in which I discuss my concerns about the trend of for-profit stem cell clinic trials being listed on Clinicaltrials.gov that in my view are not conventional trials. First a little background on Clinicaltrials.gov before I get into the interview. It is the global clinical trials website with tons of info for anyone interested in clinical trials ranging from patients to doctors to researchers and the list goes on and on. The bonus is its simple, yet powerful search tool, which works go find the specific info that you need. In the crazy, exciting, disturbing world of clinical investigative and innovative drug development, Clinicaltrials.gov stands out as a way to learn and make sense of this dizzying arena. The NIH and NLM maintain clinicaltrials.gov as a website on which clinical trial information can be deposited and accessed by principal investigators of the trials, patients, researchers, and others. It’s amazing. Here’s the interview with some intriguing insights and information from Dr. Zarin. 1. What is the purpose and mission and Clinicaltrials.gov? ClinicalTrials.gov provides the public with comprehensive information about nearly 175,000 registered interventional and observational clinical research studies – conducted in the US and worldwide. Of these, summary results are posted for nearly 14,400 records, many of which have not been published elsewhere. ClinicalTrials.gov is the largest publicly accessible registry and results database globally and receives over 112 million page views per month and 57,000 unique visitors daily. (See Trends, Charts, and Maps at http://clinicaltrials.gov/ct2/resources/trends.) Data are submitted to ClinicalTrials.gov through a Web-based Protocol Registration and Results System (PRS) by sponsors and investigators. 2. Are there certain trials that must be submitted by the PIs to Clinicaltrials.gov? In the United States, two of the most relevant requirements are FDAAA 801 and International Committee of Medical Journal Editors (ICMJE) trial registration policy. FDAAA 801, a US Federal law, includes a legal mandate for a study sponsor (or its designated PI) to register and report results for certain non-phase 1 interventional studies of FDA-regulated drugs or devices. There are substantial penalties for non-compliance. Rulemaking for this law is currently in process, though the provisions took effect starting in 2007. The ICMJE policy requires trial registration of any interventional study, regardless of phase or intervention type; penalty for non-compliance is that a journal will not consider the manuscript for publication. Other key international registration laws and policies are listed at http://clinicaltrials.gov/ct2/manage-recs/background#WhyRegister. 3. Are there certain trials that would be prohibited from being listed on Clinicaltrials.gov? If so, for what reason? ClinicalTrials.gov accepts information from study sponsors or investigators, anywhere in the world. The only requirements are that a biomedical or health-related study (1) involves human subjects and (2) complies with prevailing laws and regulations (e.g., ethics review). 3b. Follow up. Can you please tell us more about the legal, regulatory, and ethics reviews? We specifically ask for IRB info (menu of options includes: pending, approved, exempt)—and don’t allow studies to go into “recruiting” or “open” status until they have stated that they have IRB approval. We ask for, but don’t systematically enforce, a copy of at least one IRB letter. We don’t investigate other aspects of regulatory or legal status—it’s just something that the responsible party has to “certify” to us. We list the oversight authority as a service so that if there is an alleged problem the public (or we) know what entity might have oversight. This is especially true for non-US studies, for which we might not know anything about the regulatory system. 4. What investigators submit a trial for potential inclusion in Clinicaltrials.gov, how does the Clinicaltrials.gov team determine whether to allow the trial on the website? What kind of vetting is done? Is there an honor system component? ClinicalTrials.gov contains clinical study information submitted by nearly 12,500 study sponsors including the U.S. Federal government, pharmaceutical and device companies, academic, and international organizations. ClinicalTrials.gov establishes one Web-based PRS account for each organization (such as a company, university, or medical center) after an application is submitted and reviewed by a staff member. All investigators from that organization who are conducting studies are typically designated as users in this single PRS account. The organization generally designates one or more PRS administrators to manage the account and create logins for additional users. Each submission goes through a two-step process: (1) automated validation rules to detect missing information for required data elements and clearly invalid data (e.g., characters when numeric data are required) and (2) a manual review process focuses on apparent validity, meaningful entries, logic and internal consistency, and formatting. We do not assess the external validity of submitted information because we do not have a validated “reference standard” against which to check. 5. 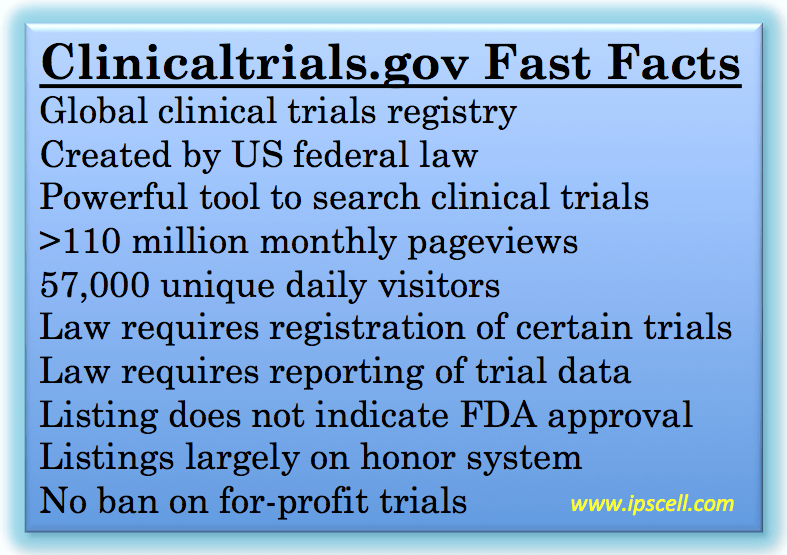 Does Clinicaltrials.gov have a specific policy about for-profit trials? If there is no formal policy, can you speak to your perspectives on this issue? Our perspective is that, as with any scientific endeavor, clinical research exists in the context of a larger “ecosystem” involving many key stakeholders, including researchers, participants, funders, investigators, regulators, and systematic reviewers. As such, the potential scientific and ethical contributions of a particular study (and design) should be considered within the context of the overall environment. For example, what is already known about the question being studied? What related studies have been conducted and what were their findings? What relevant studies are currently underway? We see ClinicalTrias.gov as a tool to help people answer such questions before a study is initiated. Once a study is planned, we believe that it needs to be registered and, after complete, summary results need to be reported in order to inform the clinical research enterprise and advance evidence-based medicine. 6. As we discussed, I am concerned about certain trials that are listed on Clinicaltrials.gov because in my view they may be more about generating profit and less about helping patients or generating data. In a general sense is it possible that Clinicaltrials.gov might in the future conduct more vetting of submitted trials? If stakeholders are concerned about certain trials is there a mechanism whereby they can express their concerns to the Clinicaltrials.gov team? In general, we ask stakeholders who detect actual errors in a record posted on ClinicalTrials.gov to contact the organization or person who submitted the information (e.g., Sponsor). For legal concerns, stakeholders should contact the regulatory agency or oversight body that has jurisdiction over that trial. 7. Clinicaltrials.gov does not currently list on the website all the information that it obtains about trials such as the specific IRB conducting oversight. Might there be a mechanism in the future whereby concerned stakeholders could make suggestions about policies related to the website such as including more info like IRB providers, costs that patients have to pay to participate, and such? To be notified about the publication of the NPRM, please subscribe to our FDAAA-UPDATE-L listserv at https://list.nih.gov/cgi-bin/wa.exe?SUBED1=fdaaa-update-l&A=1. 8. What is your vision for the future for Clinicaltrials.gov? We envision continuing our ongoing, iterative process of making incremental improvements to the ClinicalTrials.gov site. For instance, maintenance of our structured data elements is needed to ensure that new study designs can be represented accurately and searched as the scientific fields evolve. Another important area is keeping abreast of new issues that are of interest to our users so that our records and search engine can be modified, as needed, to support their needs (e.g., patient registries, CER). Ongoing examination of how we categorize stem cell studies, and whether or not we should be requiring the submission of information about whether or not payment is involved, are other examples. ClinicalTrials.gov provides key stakeholders with a tool that they can use to ensure trial transparency and to monitor and evaluate issues of trial methodology. The ultimate value of this tool will depend on how people use it. This is influenced to a large degree by laws, policies, and the overall incentive structures that influence clinical research. Some of the biggest changes, therefore, are likely to come in the form of new and modified policies that will influence how people use the ClincialTrials.gov system. Paul, this is an important topic. Thanks. Great Info for Information Searchers like me.. I have still not understood the lofty ideals behind paid Clinical Trials… simply speaking, it is for Profits & nothing else. How is it Ethical that you charge for a Clinical Trial which is Experimental in nature & one is not sure of its final outcome ? Thnaks for the artcile and great insight into Clinicaltrials Paul! As a patient with advanced COPD, I scour the site often. Some of it is way beyond my comprehension; others i are not. My question is, is there or could there be a place for patients to also register as possible future candidates for either trials they are interested in or are pertinent to their phase of illness. I would even go one step further and ask, when all else has failed, could they even register to become human lab rats?